Can you help us name our fish? 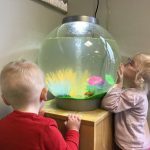 Home / Whole Nursery / Can you help us name our fish? Our Butterfly Room have welcomed two new additions to their room. Two colourful pet fish. 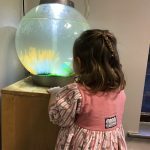 The children have been very excited watching the fish move around in the tank and have been observant in telling the special carers what they are doing. We need your help… Our fish don’t yet have names, we welcome any suggestions.